iPhone does not have an equivalent. It does have an Alert, but that is too intrusive. As such, I created my own Toaster class. 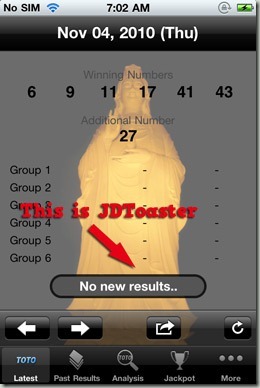 It was first used in SG 4D, 2 years ago, to show “No new results..” when user refreshed and there is no new results. That very first version was hastily created, with images used for the grey background. 2 years later, I improved my library. One of which is this Toaster class. I removed the images, and created the round radius programmatically. It is a very simple class, which I wrote within minutes. I am open sourcing JDToaster and hosting it in github public repos.